Today I’m going to show you how to ftp into WordPress and a walkthrough of the WordPress file and directory structure incase you ever need to upload a file or modify a directory or file. 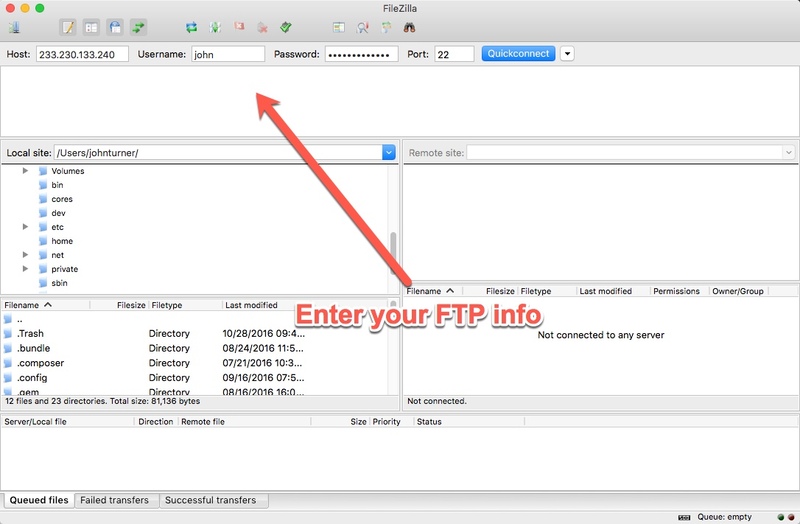 If you don’t already have a preferred FTP client I recommend Filezilla, This ftp client is free and works on Windows, Macs, and Linux. If you are looking for a nice paid FTP for Macs I recommend Transmit from Coda. After installing the ftp client the next thing you’ll want to do is get your ftp or sftp credentials from your web host. Contact your host if you do not have this information. They should provide you with a host ip or name, username, password and port number. Once you obtain this information you can then ftp into your WordPress site. Enter this info into the Filezilla Quick Connect screen. After successfully ftping into your host you’ll then will be in the root of you will need to browse to locate where WordPress is installed. Typically a web host will have the domain folders listed then once you click on the domain you will need to click on a folder that says public, www, or wordpress to locate where the root of WordPress is actually installed. Once you locate the root of WordPress you’ll see the files and folders in the screenshot below. The wp-config.php file is where you can modify your database credentials, turn on debugging for WordPress or modify any of the other setting WordPress allows in this file. The wp-content folder is where all your files live including your themes, plugins, uploads. Plugin’s may also put files in this folder for use as it relates to your site. 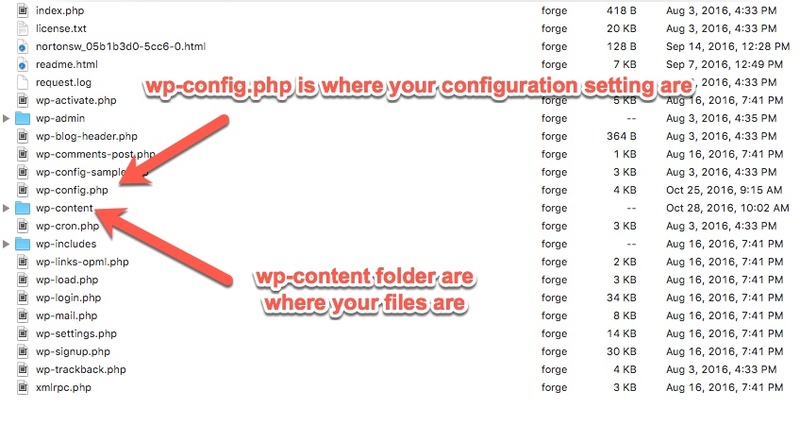 All the other files and folder outside the wp-content folder and wp-config.php file are WordPress core files and you should never change, delete or modify the files and folders. Below is a screenshot of the wp-contet folder. If you ever need to manually update or edit a theme or plugin this is where you’ll do it. 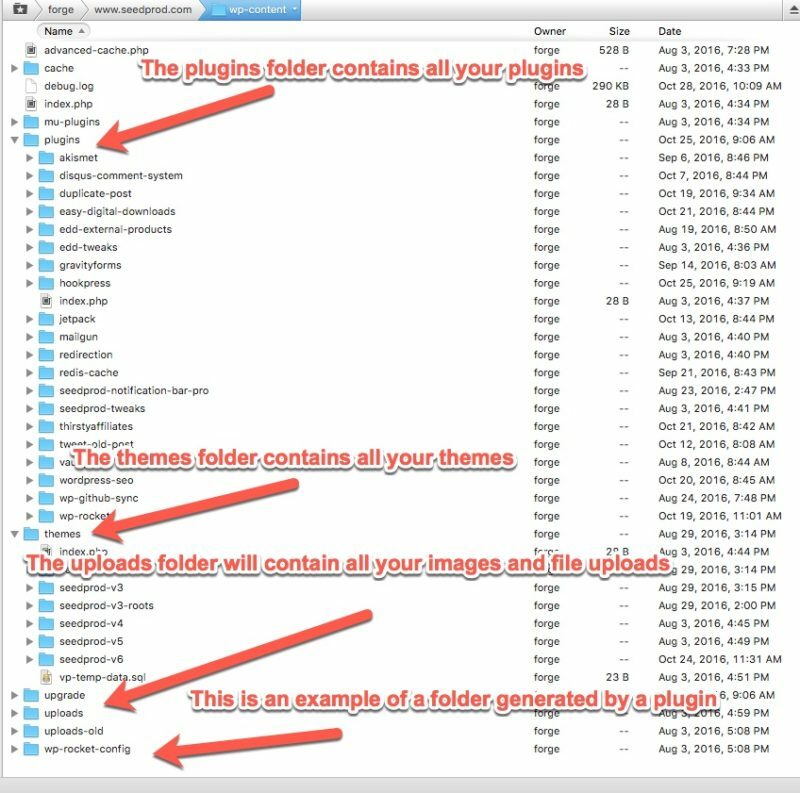 As you can see the plugins folder contains all your plugin you have installed in WordPress. The themes folder has your installed themes. The uploads is where all your images and files you have uploaded through the media library live. Then you may see other folder that are plugin specific like wp-rocket-config and cache folder in the example able. The mu-plugins folder will only exists if you are running WordPress Multisite. So there you have it! One word of cation is make sure you always have a backup of WordPress site before you go tinkering around via ftp just to be on the safe side.